Mohammed S. Dajani, the Weston Fellow at The Washington Institute, founded the Wasatia movement of moderate Islam and previously worked as a professor of political science at al-Quds University in Jerusalem. As a non-violent form of resistance to the Israeli occupation, the anti-normalization movement gained ground in the aftermath of the Al-Aqsa Intifada of 2000. Extremist groups such as Hamas and the Palestinian Front for the Liberation of Palestine (PFLP) oppose any form of dialogue and interaction with Israelis. However, while the BDS movement targets Israel and Israelis, the anti-normalization movement targets other Palestinians as well. Recently, official Arab normalization has increased, with the Saudi Arabian delegation hosted in Israel, sports delegation hosted in Qatar, and trade delegations in the UAE, Bahrain, and Morocco. Mical Polacco: What is your definition of “normalization” and where do you stand on that issue? Yet, when I accompanied Palestinian students to Auschwitz to teach them about the Holocaust it was considered ‘normalization’ and condemned as treason. The three key tenets of the anti-normalization movement campaign are: ending the occupation; equal rights for Israelis and Palestinians; and a full right of return for Palestinian refugees. Do you see a flaw in the logic of the anti-normalization campaign? Mainly, it fails to see that the Palestinian cause must be won inside of Israel and that normalization is an essential step in the process to end the conflict. For that to be achieved, Israel and the Palestinians should sit at the negotiation table and, in good faith, reach painful compromises that are agreeable to both sides. This will only happen if the Israeli public is won to the cause of peace. Advancing the anti-normalization campaign only makes this improbable, if not impossible. What is your relationship with the anti-normalization campaign ? I have no relationship with the anti-normalization campaign other than their labeling of me as a ‘traitor’ for not sharing their views opposing any kind of cooperation and joint ventures with Israel. We respect their views but they fail to respect ours. What is your opinion of the anti-normalization campaign? Is it legitimate? Though I do not agree with this campaign, I do respect their right to hold different views. However, it contradicts the 1993 Oslo Accords, which called for the end of incitement and encourages the process of normalization. These activists demand severing all contact between Palestinians and Israelis, even though they realize that this is neither practical nor realistic. Anti-normalization undermines the peace process, blocking the possibility of reconciliation and conflict resolution. Is the anti-normalization campaign a truly nonviolent resistance strategy? The anti-normalization campaign in Palestine adopts violent tactics to silence moderate voices. Through threats and violence, anti-normalization activists make it harder for organizations and individuals who are working on peace building projects. 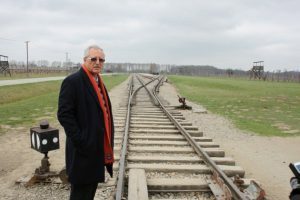 For instance, when I took 27 Palestinian students to the Nazi concentration camps in Poland to teach them about the Holocaust back in March 2014, the Workers, Staff, and Faculty Syndicate at Al-Quds University fired me from their membership. Nine political student organizations on campus issued a public statement against me titled “Normalization = Treason.” Students demonstrated against me on campus and delivered a letter to my secretary threatening to kill me if I returned to teach at the university. They later torched my car. Another example took place in June, 2016, when members of the Israeli leftist group ‘Two States, One Homeland’ entered Ramallah during Ramadan to share an iftar meal with their Palestinian colleagues. However, rocks were thrown at them and their car was torched. These intimidation tactics aim to shut down interpersonal reconciliation, weakening Palestinian civil society and NGOs. What kind of effect do you think the anti-normalization campaign is having on the Israelis and the Palestinians? What are the consequences of this movement? On the Israeli side, boycotting Israel academically, culturally, and commercially is unlikely to end the occupation. Instead it hardens the Israeli-right and empowers extremists in Israel. In effect, the Israeli government exploits the anti-normalization campaign to argue that there is no partner on the Palestinian side. On the Palestinian side, anti-normalization is a form of catharsis, psychologically releasing the anger and frustration the Palestinian people feel as a result of the brutal Israeli occupation. . Since they are heavily dependent on Israel for their daily welfare, Palestinians cannot replace boycotted Israeli products with Palestinian products. Thus, they ultimately end up buying raw materials from Israel at a higher cost, since the Palestinian Authority cannot import humanitarian resources without Israeli approval. Who pays the price for the decision to engage in dialogue? Ultimately, the victims of the oppressive occupation regime suffer the most, since the occupier who enjoys superior power and international support can keep the status quo and sustain the occupation. What do you think is the reason that pushes a person to protest against NGOs and associations that promote a meeting between Palestinians and Israelis? Mainly, it stems from the political parties competing for power, such as Hamas and Fatah, who weaken the role of civil society organizations in order to remain in control of the political agenda. There is also a strong desire to be the sole and exclusive representative of the Palestinian people whom Israelis and the international community address and to whom donors give funding. Would normalization oblige one to use the term “Security Fence” instead of the ‘Apartheid Wall; or to use the phrase “Israel’s control over Palestinian territories” instead of using the term “occupation”? I don’t see anything wrong with being civil to each other and at the same time being honest with each other. Normalization does not deny me my right to demand my rights. Normalization does not mean that one should not or cannot condemn injustices perpetrated by the state of Israel against Palestinians. Would you participate in dialogue with right-wing Israeli groups or individuals who support perpetuating the occupation and building settlements? Yes, because these are the type of people one should converse with in order to transform or understand. I don’t want to hug, have coffee, talk it out, break bread, sit around the campfire, eat s’mores and gush about how we’re all the same. Remi is a poet and poets use emotions rather than reason and compassion. When he says: “No, I don’t want to normalize with you” whom does he refer to by ‘you’: the Jewish doctor who is treating Palestinian patients and the Israeli professor who is teaching Palestinian students? Or the Israeli soldier who is demolishing Palestinian homes and the Israeli politician who is denying Palestinian rights and existence? This is what I mean when I argue that we need to make distinction between the good and the evil. If not by violent means and not by boycotts and not by anti-normalization, then how do you think the occupation would end? By undermining the radical influence on both sides, thus creating a trusting environment that would usher in a new era of reconciliation and peace through a negotiated peaceful settlement. If you believe that the anti-normalization campaign is preventing progress in advancing coexistence and achieving peace, what are you doing to confront that? In my view, it is those working in pro-normalization organizations which were established after the 1993 Oslo Accord, such as Wasatia, Yala, One Voice, Seeds of Peace, the Peace Alliance, Parents Circle or Combatants for Peace, Olive Oil Without Borders, EcoPeace, who are the true revolutionaries. They bring Israelis and Palestinians together in school, agricultural, high-tech and advocacy programs, or camps. By fostering all kinds of interactions between Israelis and Palestinians, these groups are working to construct bridges of understanding between Palestinians and Israelis to advance the causes of moderation, reconciliation, peace, and coexistence. Instead of the anti-normalization campaign, Palestinian interests require the implementation of a direct and strategic campaign to engage Israelis and to impress the Israeli public. Without cooperation, without communication and normalization, peace is impossible. And that’s precisely our goal. Professor Mohammed S. Dajani Daoudi is a Jerusalem-born scholar and peace activist who holds two doctorate degrees (University of Texas in Austin (1984) and the University of South Carolina in Columbia (1981). He is Founder of the Wasatia Islamic moderate movement in Palestine which he created in 2007 to promote moderation, reconciliation, peace, tolerance, and justice. He is Founder and Director of Wasatia Graduate Academic Institute. This item was originally published on the Fikra Forum website.